Geico is back with a few new spots, taking a break from the "hypothetical questions" shtick in favor of strange money-saving situations. 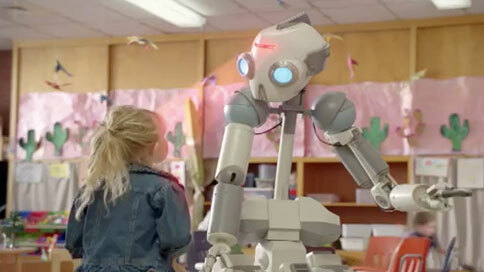 King among the new ads is "Robot Daycare," which investigates Asimov's little-known Fourth Law: A robot might not be the best choice to offer a well-rounded pre-K education. Also, did anyone else wonder why the mom randomly says "floss" at the end? I'm man enough to admit I watched it five times before my wife pointed out she's actually saying "flaws." Maybe my phonics are still damaged by that screeching grade-school teacher, Mr. Hayes SupraFAXModem 14400. Check out the ad below, and two other spots—the mildly funny "Roommate" and a slightly older execution about a 5-year-old basketball phenom—after the jump.